Already a fearful child, the sight of an eighth grade classmate—a neighbor boy—gunning down a favorite teacher in May of 1978 proved to be too much for Susie Davis. As a result, she developed irrational routines like hiding in her closet when she was home alone and later in life checking the whole house for intruders before taking her children inside. For years she functioned this way, covering her coping mechanisms well. However, she did eventually break down and that led to a season of God peeling the layers off the fears that held her in their power. With the help of her husband, friends, and especially God she was able to break fear’s chains. 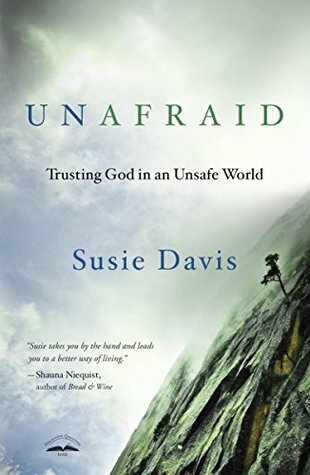 Unafraid is the story of her journey from fear to wholeness and her message of hope to other fearful people. “So many of the giants I face are in my head. Fear whispers unspeakable things and I flinch. ... This is when it’s time for me to take captive, cast down, and throw those thoughts in prison. And I do that by worshiping Jesus. Just as the wise men worshiped Jesus, I lay prostrate fore God and not before my fears” – KL 1504. “... I must daily walk away from fear. And the only way I can hope to do that is to think of fear the same way my Father things of fear. As an idol in my life” – KL 1726. Sign into Goodreads to see if any of your friends have read Unafraid.